This legislative session has been very busy. Currently, there are over 4600 filed House bills, and over 2400 filed Senate bills and additional bills are being filed daily. The Coalition has searched for HOA bills and has discovered 4 Senate bills (2 concerning condominiums) and 5 House bills that have been submitted so far. The bills are listed below for your study. Our team has not yet had time to evaluate all of them, and we continue to search for new filings. Several of these bills appear to us to be good and worth supporting. We would like your input. If you are for or against any of these bills, please let us know as soon as possible. Also, if you know of any other bills that have been introduced, that will be introduced, or that you are still trying to get introduced, please let us know as soon as possible. We can work together so that your voice is heard. SB 639 – Huffman – Relating to the operation and management of certain condominium unit owners’ associations . SB 807 – Johnson – Relating to property insurance coverage for and the appraisal of certain condominium properties. SB 2204 – Fallon – Relating to declarant control of a property owners’ association board. HB 1025 – Bohac – Relating to candidacy for and membership on the board of certain POAs. HB 1396 – Harless – Relating to the eligibility of certain persons to serve on the board of a POA. (No two at same residence). HB 2302 – Bonnen of Galveston – Relating to regulation by a POA association of certain religious displays. Companion to SB 227 by Bettencourt. HB 2992 – Vo – Relating to the amendment of the dedicatory instruments of certain mixed-use real estate developments. The Texas Legislature will begin its 86th Session on January 8, 2019. The Texas HOA Reform Coalition has just submitted a questionnaire to the candidates in anticipation of the November elections. Texas homeowners need Senators and Representatives to be aware of the unchecked power exerted by HOAs and the urgent need for laws to protect them. The following questions were submitted. When homeowners learn which candidates have responded and their concern they can exert their power with their ballots. Among homeowners in your district, would you say that many believe associations have too much power over homeowners, and that some associations abuse those powers, including the powers to foreclose and powers to regulate private property more intrusively than cities can do using zoning? Do you agree that homeowners deserve protection to prevent associations from seeking to foreclose over small debts? Do you agree that homeowners deserve protection to prevent the transformation of small debts into large debts, when associations impose unreasonable collection charges, or when lawyers impose thousands of dollars in legal fees? Do you agree that lawyers, property managers, and other officials of associations should be more accountable to homeowners, including by making it easier for homeowners to obtain information (on the Internet or otherwise), holding more open board meetings, and with term limits for directors? Since almost none of the few laws that seek to limit association abuse impose any penalty for violations, would you support adding teeth to laws that protect homeowners, including a penalty for significant violations? Do you agree that all association regulations, including those that regulate the use of a homeowners’ property as well as all fees and charges, should be reasonable? Do you agree that associations should not be allowed to interfere with the purchase and sale of property, such as by imposing large “transfer” fees? Are you aware that associations in some subdivisions caused significant problems for homeowners seeking to rebuild after Hurricane Harvey? The Texas HOA Reform Coalition will provide the results of this survey when responses are tabulated. After thirty years of oppressive HOA laws, some legislators have stepped forward and filed bills to alleviate the injustices suffered by homeowners. Especially helpful are bills filed by Representatives: Vo – HB 3528, Munoz – HB 1341, Shaheen – HB – 923, and Schofield – HB-522, and Senators : Menendez – SB 2234, and Bettencourt and Kolkhurst – SB – 1609. Now the bills rest in committees: House Business and Industry, Senate Business and Commerce, and Calendars. Legislators on those committees are determining if this 30 year attack on homeowners’ rights and protections will not only be stopped but if they will assist in restoring those protections to Texas homeowners. All Texas homeowners should follow the progress of these bills at Texas Legislature Online. To learn how legislators voted, see FAQ #11 TLO. Let the 85th Texas Legislature know that they have been elected to represent you and not the lobbyists. If the goal of subdivisions, townhomes, and condominiums were to serve, then the question most heard from owners would not be, “They can’t do this, can they?” “This” is usually found to be the fines, fees, harassment, control, liens, and foreclosure suffered by multi thousands of homeowners. Attempting to justify their behavior, the boards, managers, and attorneys often allude to their concern for property values, but harassment and foreclosed properties are no assets to communities. Neighbors who live by the “Golden Rule” are the true assets to communities. Listed below are messages from Texas homeowners overwhelmed by the abuses they have suffered by HOA boards, management companies, and attorneys. Representative Vo (HB 3528) and Senator Menendez (SB 2234) have filed these identical bills in an effort to alleviate some injustices inflicted by 30 years of HOA Industry laws. We ask that you do all in your power to get HB 3528/SB 2234 passed by both houses. There are other HOA – homeowner-friendly bills that would correct other injustices. We will be contacting you about these bills also. El Paso – 2017 – 86-year-old woman is on the brink of losing her fully-paid-for home because of a complex, condo association late-fee scheme. On a monthly income of about $800, she paid $240 in monthly condo fees and an additional “special assessment” fee once a year. After she was late paying the “special assessment” fee, her condo association charged her late fees of $90 every month for 17 months in a row – even though she paid the 2015 special assessment fee a few months after it was due and never missed her monthly condo fee. Her condo association initiated foreclosure and sold her $85,746 home for $4,183. San Antonio – 2017 – Our Condo Association high rise board president has put forth an elaborate new violation and fine policy. The violations are many and most are petty. The 1st violation would bring a letter of warning, the second $150, third $300, and 4th $500. The violations could occur 10 days or 10 years apart and could be on 4 different infringements, (e.g. keeping a grocery cart 15 min. too long). The president has termed this “cumulative”. The policy seems outlandish, unrealistic, and unenforceable. Richmond – 2017 – In Oct 2016, I called our HOA and made a payment on our annual assessment. My wife had heart surgery in Nov 2016. I called back in Dec 2016, to make another payment. I was told that they could not accept my payment. My account had been turned over to an attorney for collection. We did not receive prior notification of this. We tried several times to contact the HOA manager to clarify what was going on but never got any responses. We requested a hearing or some answers in writing from the BOD about the matter. We never received any response from the BOD. We contacted the attorney’s office the HOA hired. The attorney’s office added outrageous fees and additional costs to include fees and default for the new upcoming (2017) assessment which was not yet due. The attorney’s office said that we could not speak to the HOA manager concerning the matter until we paid all monies due. To avoid further costs and fees, we sent in (before the deadline) the amount stated that we owed (with which we disagreed) minus the attorney’s fee for a default on the new assessment that was not yet due. (We sent a separate check for the new assessment amount, as advised). The attorney’s office rejected the payments sent in, added additional interest, late fees and default fee and also filed a pending foreclosure document. We filed a complaint with the HOA BOD but have not heard anything from them. Where do we go next? Tomball – 2017 – A registered nurse writes 4/4/17: I am dealing with my HOA placing a lien on my home due to my HOA fees not being paid. They have completely harassed me while refusing to take my payments. Is there any help out there? Nacona – 2017 – In our situation, the multi-lot owners have rigged the voting system to get one vote per lot, BUT these multi-lot owners don’t pay on all of their lots. One property owner has 746 lots and gets 746 votes, but pays on only 10 lots. This system has drastically decreased our association revenue and the management keeps trying to increase our maintenance fees. There are 2 Convicted felons (have documents) managing our HOA. We did not choose either one of them. The general manager is a federal convicted felon of Medicare/Medicaid fraud throughout most of the ’90’s and served in a California penitentiary. He knows exactly how to “cook the books” to send only what he wants us to know. (our financial reports are very general and vague.) The other felon has 3 felonies, mostly drug related . We need a law that prohibits felons from managing financial affairs of HOA’s. There is a state law for felony board members who serve on a board. We need this law to apply to managers also. Houston – 2012-2015 – I did research on our HOA for the period January 1, 2012 through July 31, 2015, and during that period 51 law suits were filed against our homeowners. The suits sought to collect a total of $11,946.72. The requested attorney fees were $153,000.00. I am a retired accountant and can provide details. Dickinson – 2016 – Thought $514 dues had been rolled into refinance. It was not. When owner tried to pay, not allowed to because it had been sent to a collection law firm, and sum was now more than $4,000. Not allowed to pay dues and now demand is for $8500.00 on $1,000. Debt that owner has tried to pay many times. On 12/1/16, a summary judgment demanded $9,058 for $1400. of debt and $7500. attorney’s fees. San Antonio – 2017 – My HOA charges $20. late fee each month owner is behind plus interest. Houston – 2017 – I spent $22,500. improving my driveway appreciated by my neighbors and myself but because I did not know to ask permission to improve my property I am facing $20,000 fines, injunctions, and court battles. I feel I am living in a tyrannical society. Rockwall – 2016 – My daughter got behind in her HOA payments and owed $500. which has turned into just under $7,000. She sent a check for $2,000. and planned to send her tax return of $1,900. The lawyer said they had not agreed to any terms and returned her payment and she is facing foreclosure. Dallas – 2014 – The property management company keeps billing homeowners for extra fees of $1,200. and $800. for no legitimate reason and are now billing all homeowners for a major office fire $800. What agency controls these HOAs, management companies, and attorneys? Houston – 2017 – .My HOA changed hands with a new owner that has about 80% of the units and other homeowners having the remaining 20 %. The new owner wants to make the mid-rise building in Houston an all rental building. At a recent 2017 meeting the new owner increased the HOA dues about 230 % from the original dues . He stated that the building needs major rework. That same work was done 4 years earlier at a cost of $1 million dollars or more. Frisco – 2016 – Involved are multiple documented instances of fiscal malfeasance and willful gross negligence related to debit card abuse, check fraud, self-compensation, commingling of funds, bid rigging, illegal use of undocumented workers (tax fraud), favors to friends, budget manipulation, whistle-blower retaliation, electoral fraud, and outright theft. Mission – 2017 – HOA may communicate, but for every single notice that they send. We will be charged with a lot of money on fines and fees. They charge more than a bank when you fail to make your payments on time. San Antonio – 2015 – Navy veteran paid his mortgage but returned to San Antonio to find a letter to vacate his home in 11 days. The $900 he owed in HOA dues turned into $15,000 in legal fees fighting the HOA. Kingwood – 2016 – We have a blatant violation of board election laws, and this has occurred twice. In addition, the management firm wants over $400 for individuals to review records. Flower Mound – 2016 – I was only six months delinquent when the HOA put a lien on my house. The attorney stands to collect over $3500.00 in attorney fees for an $840.00 outstanding liability. Austin – 2015 – Uncle of property owner who had the owner’s proxy and POA to represent his nephew at a board meeting was called a “criminal trespasser”, was arrested, placed in a squad car and taken to jail where he was finger printed, mug shot taken, booked in for criminal trespass and locked up for three nights and two days. During his jail confinement he was strip searched by two men and a woman. Ultimately the wrongful criminal trespass charge was dismissed by a judge on May 7, 2016. Travis County – 2017 – POA initiated foreclosure proceedings when owner owed less than $80. in assessments but over $2100. in attorney fees, court costs, and related expenses. San Antonio – 2011-2012 – Embattled San Antonio Ventura HOA homeowners finally got justice. A series of disputes began when the former HOA president shut residents out of their own board meetings in November 2008 and, with the aid of her selected attorney, chose to sue 8 homeowners rather than meet with residents. Legal costs to the HOA in excess of $200,000 ensued over the next two years as residents refused to be silenced until the court intervened in October 2010. In a trial that began December 10, 2011, the jury got the case at 3:30, Friday, June 21, 2012, and came back with a verdict at 7:00. Both the former board president and the attorney were found guilty of breach of fiduciary duty with $208,000 in damages to the Association. The attorney was hit with an additional $50,000 in exemplary damages. Jury members said the breach of fiduciary duty verdict was a no brainer. They say the haggling came in deciding what to award Ventura. Chimney damaged in Hurricane Ike (we fixed and have receipts from supplies purchased. It was fixed 3 days after receipt of letter from HOA. Trash can on side of house. Thirty years of HOA laws have wreaked havoc on Texas homeowners. The above stories are a very small sampling of the many thousands who have suffered HOA abuse. Please pass HB 3528/SB 2234 to help Texas homeowners. Thank you. Every legislative session, Texas legislators have to consider new HOA laws and work through numerous committee meetings and panels. Why does this keep happening? Why has past legislation not resolved the HOA issue? The sources of these legislative requests are two-fold. One source is the HOA Industry’s constant requests for more ways to take money and power from homeowners, but pleas also come from homeowners who have lost significant rights of privacy and control and have become subject to fines, fees, expanding deed restrictions, and foreclosure. Texas homeowners, in single-family, condos, or townhomes, need just laws that include open meetings and open records, repeal of Property Code Section 5.006, and an end to fines and foreclosures. In 1980, a lawsuit between an HOA and a Texas homeowner was on an even playing field with respect to attorney fees – i.e., each party paid its own attorney fees. Today, and in fact, since 1983, a new law granted to a Texas HOA a powerful weapon against a homeowner – the right to recover the HOA’s attorney fees while the homeowner has no complementary right. In 1980, the Texas Constitutional homestead protection prevented an HOA from foreclosing on a home. Today, and in fact, since a Texas Supreme Court decision in 1987, the Constitutional homestead protection is ignored for all HOA liens for assessments. There was no statewide election on an amendment to the Texas Constitution on whether to eliminate the homestead protection. There was no legislative vote on a new law to eliminate the homestead protection, with the accompanying committee hearings and ultimate governor signature. There was not even a court hearing where Texas homeowners in general or even one Texas homeowner presented arguments against the loss of the homestead protection. Texas homeowners lost their homestead protection in a Texas Supreme Court 3-2 decision, that reversed “judgments upholding the homestead protection by the trial court and the court of appeals”, where only the HOA had an attorney and only the HOA presented arguments. No one argued for the Texas homeowners. Now, Texas HOAs file thousands of foreclosure actions every year, causing many Texas homeowners either to abandon their homes or to lose their homes at foreclosure sale. HOA attorneys and HOA management companies reap untold profits every year from these foreclosure actions – all taken from Texas homeowners. In 1980, without the consent of the homeowner, a Texas home could never be subjected to an HOA. Today, and in fact, since 1995, a 1995 law allows an HOA in Harris, Galveston, Brazoria, and Montgomery Counties to be forced on a nearby Texas homeowner without the homeowner’s consent. A Texas homeowner can own a home outright for forty years, and then, suddenly, without the homeowner’s consent, the homeowner can be subject to mandatory HOA dues, HOA rules that control the use and appearance of the home, and the risk of HOA fines and foreclosure. After 1995, foreclosure filings in Harris County rose from below 500 in 1990 to about 2200 in 2007. 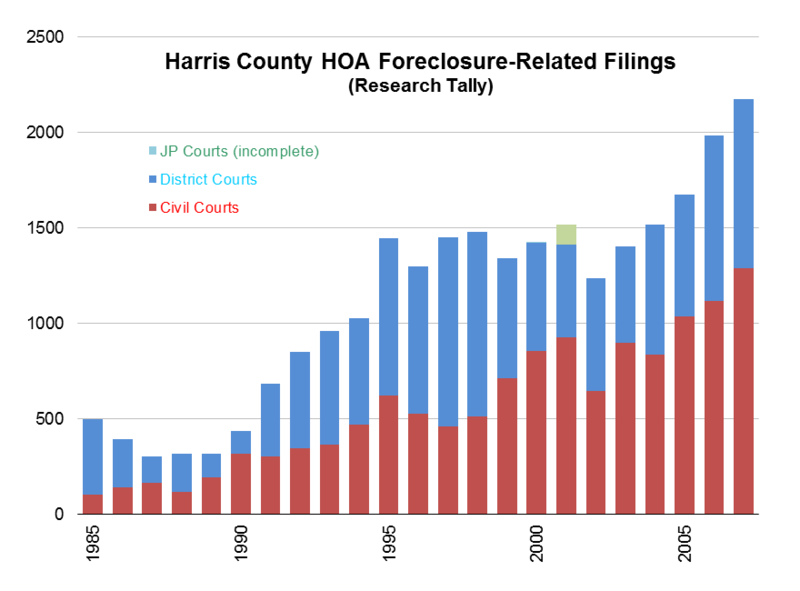 In Harris County from 1985 to 2007, HOA foreclosure filings totaled 25, 726. Below is a summary of some of the requests by the HOA Industry that were granted over the years. This does not include many other requests that have not been granted. These bills have been filed for certain areas defined by county populations and/or adjacent counties – not by name. There are 253 counties in Texas. By 2010, five counties had over 1,000,000 people; the smallest had 112. The general public does not know all county populations, but each legislator certainly knows those in his/her district, and can quickly determine if a bill will affect the district. Overcome the law against perpetuitues and give HOAs a way to make deed restrictions last forever. Give HOAs a way to modify deed restrictions that do not allow modification. Give HOAs a way to make it very difficult for homeowners to see records and allow HOAs to charge fees for letting a homeowner see records. Allow HOAs outside Houston and many HOAs in Houston to bar a homeowner from voting in an HOA election by citing the homeowner for violations OR by simply claiming that the homeowner owes assessments, fees, or fines (including attorneys fees). Texas Property Code Section 5.006. The statute generally allows only the first party to file the suit to recover attorney fees. If the Constitution is to be amended to destroy or weaken an individual’s homestead exemption, it should be done as prescribed by the Constitution in article XVII, section 1. What is required is passage of a *642 proposed amendment by at least 100 affirmative votes of the members of the House of Representatives and at least twenty-one affirmative votes of the members of the Senate, and a majority vote of all the people of this State who choose to vote at a public election held for that purpose. TEX. CONST. Art. XVII, § 1 (1845, amended 1972). A strict construction of our Constitution requires this result. I would require no less. Texas Property Code Chapter 204. Texas Property Code Chapter 201. The statute allows creation of new deed restrictions by 50% approval and modification of existing restrictions by 75% approval. However, an owner can affirmatively opt out of a new deed restriction under Chapter 201. Property Code Chapter 202; Acts 1987, 70th Leg., ch. 712. Property Code Chapter 204; Acts 1995, 74th Leg., ch. 1040. House Bill 2152 passed on the third reading May 27, 1995. The bill was then sent to the Senate. Senator Gallegos moved that Senate Rule 7.18 and the Constitutional Rule requiring bills to be read on three several days be suspended and that H.B. 2152 be placed on its third reading and final passage. The motion prevailed by the following vote: Yeas 31, Nays 0. The bill was read third time and was passed by a viva voce vote. The Senate passed the bill May 27, 1995. The bill was enrolled May 28, 1995, and sent to the Governor May 29, 1995. Property Code Chapter 201.0051; Acts 1997, 75th Leg., ch. 1249. Acts 1999, 76th Leg., ch. 1198. Acts 2001, 77th Leg., ch. 926. Acts 2005, 79th Leg., Ch. 1004 (H.B. 638). Acts 2007, 80th Leg., R.S., Ch. 711 (H.B. 2218), now 204.011(d); Acts 2007, 80th Leg., R.S., Ch. 1367 (H.B. 3674); Acts 2007, 80th Leg., R.S., Ch. 767 (HB 3518) now 204.003(b) and (c). Acts 2009, 81st Leg., R.S., Ch. 87 (S.B. 1969), now 204.003(d); Acts 2009, 81st Leg., R.S., Ch. 821 (S.B. 1672); Acts 2009, 81st Leg., R.S., Ch. 148 (S.B. 1919). Acts 2011, 82nd Leg., R.S., Ch. 1282 (H.B. 1228); Acts 2011, 82nd Leg., R.S., Ch. 1142 (H.B. 1821); Acts 2011, 82nd Leg., R.S., Ch. 263 (H.B. 1278). Acts 2013, 83rd Leg., R.S., Ch. 1389 (H.B. 680). How can this happen in Texas? The short answer is that, since the early 1980s, commercial interests – primarily HOA attorneys and HOA management companies (the “HOA Industry”) – have worked to change Texas laws to allow the HOA Industry to make yet more money from Texas homeowners. Every legislative session, these commercial interests have lobbyists trying to convince Texas legislators to grant more power to the HOA Industry. Since at least the early 1980s, Texas homeowners have lost significant rights of privacy and control, and have become subject to fines, other money judgments, injunctions which control their lives and homes, and foreclosure. This assault, authorized largely in secret, reflects power given to HOAs without voter approval or even voter knowledge. For too many homeowners it is the devastating loss of home and savings. From the first time an attorney is involved, the stakes for the homeowner change. 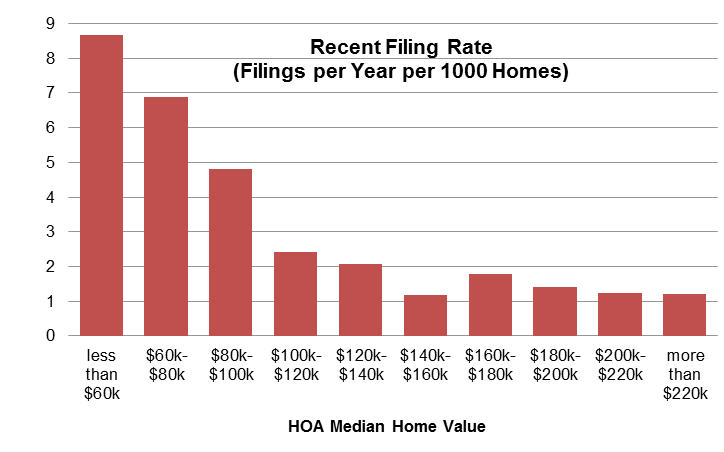 The HOA attorney fees add up quickly, usually exceeding the original dispute cost. The longer the suit continues, the bigger the financial risk for the Texas homeowner, but not for the HOA. This one change has forced thousands of Texas homeowners to capitulate in disputes with HOAs because a dispute over an oil spill or a basketball goal just is not worth the risk of thousands of dollars in attorneys’ fees. In 1980, without the consent of the homeowner, a Texas home could never be subjected to an HOA. Today, and in fact, since 1995, a 1995 law allows an HOA in Harris, Galveston, Brazoria, and Montgomery Counties to be forced on a nearby Texas homeowner without the homeowner’s consent. A Texas homeowner can own a home outright for forty years, and then, suddenly, without the homeowner’s consent, the homeowner can be subject to mandatory HOA dues, HOA rules that control the use and appearance of the home, and the risk of HOA fines and foreclosure. In 1980, a Texas home could never be subjected to new deed restrictions without the homeowner’s consent. Today, and in fact, since 1995, in that same Houston area, that same 1995 law allows an unlimited number of new HOA deed restrictions to be added without a homeowner’s consent. In 1980, a Texas HOA had only the powers expressly listed in a formation document – powers agreed upon by every homeowner in the HOA. Today, and in fact, since 1995, that same 1995 law grants to a Texas HOA in the four Houston area counties not only its expressly listed powers but also many unidentified additional powers that the HOA may think “necessary and proper” or implied. In 1980, Texas HOAs generally did not charge homeowners any fees, and in fact, many HOA dues were not mandatory. Today, and in fact, since 1995, that same 1995 law and other more recent laws allow an HOA to charge resale certificate fees, document copy fees, collection fees, inspection fees, violation enforcement fees, transfer fees, and many other fees that an HOA or management company or HOA attorney can dream up. The potential list of fees has no end. HOA attorneys and management companies now earn millions of dollars in revenue from fines and fees charged to homeowners. The HOA industry won all these new powers by enactment in 1995 of Texas Property Code Chapter 204. The Legislature passed this new law at the 11th hour on the last day of the session, on a voice vote, rules suspended twice, absent public knowledge or media attention. The HOA industry wrote the 1995 bill as a “bracket bill”, i.e., a bill bracketed to a particular, but unnamed geographic area defined only by population (in 1995, just Harris and Galveston Counties). When a bill applies only to a limited geographic area, legislators who are not from that area often pay no attention to the bill or give deference to lawmakers from the specified area. Obviously, the effects of this bill have continued and expanded across the state. The result of this thirty-plus year assault on homeowner rights has been catastrophic for many Texas homeowners. Most Texas home buyers have little choice but to buy a home subject to an HOA. HOA foreclosures have exploded. HOA fines and fees have multiplied. After 1995, foreclosure filings in Harris County rose from below 500 in 1990 to about 2200 in 2007. In Harris County from 1985 to 2007, HOA foreclosure filings totaled 25,726. HOA foreclosures in Harris County adversely affect poorer homeowners. The vast majority of HOA foreclosure filings are against lower income homeowners as shown by the table below for 1985-2001 (with 2001 home values). Many homeowners threatened with foreclosure have little chance to pay off the thousands of dollars in attorney fees that are demanded early in these cases. This has led many homeowners just to abandon their homes. Developers on occasion also align with the HOA Industry. If the Constitution is to be amended to destroy or weaken an individual’s homestead exemption, it should be done as prescribed by the Constitution in article XVII, section 1. What is required is passage of a proposed amendment by at least 100 affirmative votes of the members of the House of Representatives and at least twenty-one affirmative votes of the members of the Senate, and a majority vote of all the people of this State who choose to vote at a public election held for that purpose. TEX. CONST. Art. XVII, § 1 (1845, amended 1972). A strict construction of our Constitution requires this result. I would require no less. In a typical arrangement, a management company contracts with an HOA at below-market rates and makes its profit through fines and fees charged to homeowners. The HOA and the management company benefit at the expense of the homeowner. The graphic is based on information from HOADATA.ORG. This graphic is also from HOADATA. 2017 is fast approaching and that means the Texas Legislature will meet for its 85th session. The regular session begins January 10, 2017, and ends May 29, 2017 – 140 days. Examine the regulatory powers of property owners associations and the procedures available to home owners when an association restricts individual or property rights. Review current best practices to help clarify the balance of property rights, transparency in governance, and the best interests of property owners in the state. CAI/TCAA witnesses Mike Walker and Marta Gore. Attorney Gregory Cagle stated that he represented both POAs and homeowners adverse to their POAs. Attorney David Kahne stated that he represented homeowners adverse to their POAs. Texas homeowners must unite to demand their rights which have been taken from them over the past 30+ years. The HOA Reform Coalition is waiting on the results of the November 8, 2016, election, to learn names of all the members of the 2017 Texas House and Senate. Several other concerns were brought up during this workshop which the Coalition plans to present during this coming session. The plight of those who live in POAs has too long been ignored. The Coalition needs Texas homeowners to contact their state Senators and Representatives regarding their own problems and when their support or opposition is needed for proposed bills. The Coalition will send periodic emails during the coming session to alert you to various bills that will need your support or opposition. Let 2017 be the Year of the Texas Homeowner! Whew! What a few weeks this has been. Heavy rains. Flash floods. Tornados. And yet we did meet for the HOA Reform Fall Conference on Saturday, October 24. Despite the many last-minute cancellations, some members managed to travel from San Antonio, Austin, and even from the Dallas-Fort Worth area. Good work was accomplished and we had an opportunity to honor Mary Lou Durham who was most helpful in homeowner successes at this past session. Attorney David Kahne presented a review of the new Texas Legislation which is now available on his website http://texashoas.org/. David and Nancy then discussed preparation for the 2017 legislative session which was followed by members ranking the issues. Their choices are being studied and will be discussed over the next months. Attorney Bill Davis arrived from the Austin area to explain “The Not-So-Omnipotent HOA – Chapter 1”. Bill has found there are so-called HOAs which exert powers not rightfully theirs. David and Beanie then described some national issues covered by activists. Shu Bartholomew, who has a weekly radio show, has also established a website Shu@fromthehoatrenches.com and invites homeowners from across the nation to tell their stories. Rodney Gray’s documentary feature film, The HOAX, was screened in downtown Dallas on October 18. Jan Bergemann has the Florida website http://www.ccfj.net Attorney Evan McKenzie is a recognized national authority on HOA issues. His book, PRIVATOPIA revealed the background and intent of the HOA/CAI Industry. There was strong support at the Conference for single-issue bills, which have been on the homeowner agenda for over a decade. Homeowners prefer single issue bills but inevitably an HOA Omnibus bill includes our issues. Most single-issue bills have no traction and don’t make it out of committee. In this session one bill HB 971, filed by Rep. Dwayne Bohac would confirm officers and directors of pre-TUCA condos (created before 1994) the same fiduciary duty towards the members as applies to condos created under TUCA (created after 1993). This bill required the Officers and Directors to affirm they had read all of the documents and would enforce them. Now we know that all homeowners are expected to have read all of their documents. When cited for a violation, owners are told, you must know the rules, yet here when the “rulers” are told they must know the rules, the bill dies in Calendars because of fierce opposition. The HOA Reform Coalition vigorously supported the bill. Another single-issue bill was HB 1335, sponsored by Rep. Gutierrez at the request of The Texas Family Council. HB 1335 would have put a $500 cap on legal fees for which the HOA could demand reimbursement from the homeowner. There is currently NO cap on legal fees in a judicial foreclosure. HB 1335 was referred to Business and Industry and never got out of committee. Open Meetings 209.00591; Running for director 209.00593; Voting, 209.0058 Also, 209.00592 absentee owner voting rights; Notice of violations 209.006; Priority of Payments. Go to Attorney Kahne’s website http://texashoas.org/ for full information. Senator West’s bill SB 1168 (co-sponsored by Rep. Villalba in the House HB 2797) was sailing through with a couple of frightening possibilities. We had asked and been denied the rule for certified mail notice as well as the right of a candidate to have a monitor observe ballot counting. On May 23, when SB 1168 was presented to the House of Representatives, Rep. Bohac stepped forward and offered Amendment #5 to strike “verified” and insert “certified”. Rep. Villalba moved to table but his motion failed. Certified mail has been the gold standard for mail providing assurance of delivery. Amendment #5 was adopted. Then Rep. Bohac offered AMENDMENT #6 which provided that each candidate may name one person to observe the counting of the ballots provided that this does not entitle any observer to see the name of the person who cast the ballot, and that any disruptive observer may be removed. The industry had vigorously opposed these two amendments. Amendment #6 was adopted. We already have heard of the law being used to secure observers that enable election of pro-homeowner directors. Rep. Doug Miller then proposed Amendment #7 stating that a person may not vote in a POA election unless the person is subject to a dedicatory instrument governing the association through which the association exercises its authority. Amendment #7 was adopted. Three homeowner amendments had passed. Then the bill went back to the Senate. The Senate concurred in the House amendments. SB 1168 was signed by the governor on June 18, 2015, and became effective on September 1, 2015. Our Coalition is hoping the legislators are becoming aware of the injustice that was perpetrated on Texas homeowners by Property Code 204 and subsequent laws. Total power was given to HOA boards with no accountability. A homeowner’s only recourse is a costly lawsuit, so beneficial to the CAI/HOA attorneys. Sign, and the bill becomes law. Veto, and the bill does not become law. Does not sign and the bill becomes law on the date stated in the bill. You may click on the bill number to obtain a complete copy of the final bill. Also indicated below is the effective date of the bill. Those that were signed by the governor are so indicated. HB 2489 – Leach (Rental Restrictions) Signed Effective immediately. Homeowners had no warning. Homeowners didn’t surrender. Quietly and without fanfare, the Texas legislature took away our property rights and gave them to the HOA Industry: the lawyers who run foreclosure factories, property managers who charge us for their own irresponsible management, and boards that would deny us liberty in our own homes. Too often, homeowners only learn of the HOA Industry control when they get hit by exorbitant and unlimited attorney fees and fines, liens, and foreclosures, or when a cabal takes over their community, frustrates fair voting, meets secretly, and hides records. Yet, even as HOAs increase their control of owners’ daily lives, the HOA industry opposes any change, any regulation labeling it “government control”. They have it exactly backwards. The HOA is the out-of-control agency. We want to end bad statutes that give excessive power to invasive lawyers, property managers, and boards. Our goal is to restore fundamental constitutional rights – to allow all members to have a voice in self-governance and to promote harmony rather than division in communities. Our goal can only be achieved by the “power of the people”. Texas homeowners must unite in their neighborhoods to reclaim their rights denied by the HOAs. They must demand their representatives in the Texas Senate and House truly represent them and not the HOA lobbyists. The HOA Industry opposition is always fierce, instilling fear of change. The wanna-be overseers enjoy their power and control and testify at legislative hearings how wonderful HOA life is. Those who rule do have a wonderful life, but they ignore the serious overreaching. The HOA industry is living on your money. Reclaim your rights and your money. Tell us what laws you want changed. Have your neighborhood group ally with the HOA Reform Coalition today! If you want to know who represents you, click here!